It's happened to most of us. You drive past one of your old hangouts, restaurants, or stores that has since closed for business, and you are suddenly bombarded with old memories. Maybe they have to do with good times had with friends or family, or simply an incredible value of services or entertainment experienced. This my friends, is how I feel every time I drive by former Shakey's Pizza Parlor locations once frequented during my youth. Sadly, there are no longer any Shakey's restaurants located in the state of Colorado. I do however regularly pass by two of the old locations, and thought I'd share some pictures of what they look like today, as well as a few lingering memories. The Shakey's location shown above has been a gas station for many years now. Other than the rectangular shape and size of the structure, there are no other features still present that even faintly resemble a Shakey's Pizza Parlor. This is the Shakey's I visited the most during my youth. It was only about a mile away from my home, and I would often ride my bicycle there to get some lunch and play video games. Very seldom do I drive by this location without reminiscing about my many visits there throughout the late 70s and early 80s. I remember playing classic arcade games like Battlezone, Tempest, Ms. Pac Man, and one of my favorites which was a less popular game at the time called "Cheyenne". Cheyenne was a stand up console that had a rifle mounted to the play board. The point of the game is to protect lawman "Buster Badshot" from gangs of outlaws, wild animals, and various other hazards. The gangs of outlaws included cowboys, Indians, hillbillies, Mexican Bandidos, and from what I remember, some women outlaws as well. There were several levels such as saloons, mines, deserts, forests, ghost towns, graveyards and canyons. I used to get a kick out of the fact that the game allowed you to shoot at random objects, like bottles, lanterns, and even a piano player in the saloon level. My folks had to literally drag me away from this game when the pizza hit the table (and that's saying something if you know how much I love pizza). As you can see, apart from the old stained glass windows that were a fixture at the old Shakey's Pizza Parlors, this building still very much resembles an old Shakey's. I can probably only count on one hand, how many times I dined at this location. It was usually when we went to this town for concerts, or other events, and were in search of sustenance before our 30 mile trek back home to Fort Collins where we lived. I know of numerous other Shakey's locations that were located in other parts of the state, so maybe I'll do some research as to where they were, and post some pictures soon of what they now look like. I loved that place bring it back!!! Pizzaholics of the world.. Holler at me! Hello, my name is Darrin a.k.a. "The Pizza Chap"
A Florida pizza artisan & connoisseur that eats, sleeps, dreams, and writes about pizza. 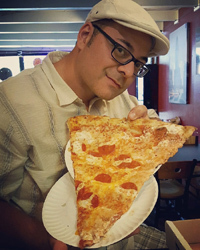 Come join me on my perpetual quest to find the perfect slice! Review - Old Chicago Restaurant "Oh my Spaghetti Pie"
Find me on the Interwebs.. The Pizza Chap is a personal blog of Darrin Vindiola Sr. Opinions expressed here represent my own and not those of any employer. All content and information provided on this blog is for informational purposes only, and I will not be liable for any errors, omissions, delays in information, losses, injuries, or damages arising from use of information provided. Copyright 2018-19. Awesome Inc. theme. Powered by Blogger.